Red Bull were one of four teams on the grid not changing their driver line-up for the new season. Reigning World Champion Sebastian Vettel was with Mark Webber for the fifth season running, and this time, their car was purple(ish). It was generally assumed that given the monumental regulation changes for 2014 and essentially no changes for 2013, teams wouldn’t sway a whole lot from their 2013 positions. This would suggest a Red Bull/Ferrari battle with McLaren throwing their hat in the ring. At the first race in Australia, Red Bull were more dominant than could have been expected, with Vettel taking pole from team-mate Webber. However, the team’s dominance was eradicated in the race and Vettel dropped to third behind Raikkonen and Alonso, while Webber finished sixth at his home round. In Malaysia, Vettel once again took pole position while Webber qualified fifth. During the race, despite a predictable poor start by Webber, he took the lead after the final round of pitstops. Vettel was right behind his team-mate and the team issued the multi-21 team-order which means that car 2 (Webber) stays ahead of car 1 (Vettel). The order was sent and so Webber turned his engine down, thinking Vettel would obey the order. On the contrary, Vettel attacked Webber, to the soundtrack of team-principal Christian Horner’s desperate cries of “this is silly, Seb, come on”. After several tense laps, Vettel got past his team-mate and won the race. The fallout was immense and would divide fans, particularly against Vettel who, as a result, would be booed at several of the remaining races. stilities between the two team-mates were at an all-time high and Webber’s form was no less improved when his team under-fuelled the car and he was disqualified from Qualifying. While in the race, he collided with Toro Rosso’s Jean-Eric Vergne and following a pit-stop, his wheel came loose at the hairpin, causing him to retire on the spot. Vettel, in the meantime, finished just shy of the podium when he crossed the line fourth. The Bahrain Grand Prix marked Mark Webber’s 200th Grand Prix and he celebrated this milestone by qualifying fifth and then incurred a three-place penalty for the collision with Vergne in China, with team-mate Vettel lining up second on the grid. Vettel eventually won the race and Webber finished seventh. Vettel and Webber were third and eighth on the grid respectively, and finished fourth and fifth in Catalunya. Although Red Bull had held a firm grasp on the Monaco Grand Prix in recent years (Webber winning ’10 and ’12, Vettel winning ’11), they failed to take the lead of the race from pole-man Nico Rosberg who went on to become the races eventual winner. They did, however, join him on the podium with Vettel second and Webber third. As if to make up for not winning in the principality, Vettel took victory from pole at the Circuit Gilles Villeneuve. Webber qualified fifth, but failed to make the podium when he was hit by Caterham’s Giedo van der Garde mid-race. He went on to finish fourth. Before the British Grand Prix, Webber announced that he was to leave the sport at the end of the season to head to the World Endurance Championship with Porsche. This, naturally, led to a scramble for the t0-be vacant seat at the World Champions, especially from the Toro Rosso ranks. It was at Silverstone, mere minutes from his home, that he made the announcement, and Webber was essentially a British citizen – adored by the fans at the race he won twice. As such, he was looking to win his second-home race. He qualified fourth behind Vettel, but after a bad start and contact with a swiping Romain Grosjean, he dropped to fifteenth. His front wing was also damaged, which further hurt his chances. Race-leader Hamilton dropped from the lead following a tyre delamination and Vettel inherited the lead. That was until a gearbox failure saw him creep to a stop, much to the delight of the crowd. Rosberg took the lead but Webber was charging. In the end, he finished 0.7 behind race-winner Rosberg, who had been losing a second per lap to Webber up to that point. The next race was the German Grand Prix at the Nurburgring. It seemed like fate was in Webber’s favour as this was the track at which he took his first pole and first win in 2009, and was definitely one of his strongest tracks. On the other hand, Vettel had a home-race curse, having never won a race in Germany OR in July. Webber started third behind Vettel, but was faster than his team-mate as the race progressed. He seemed like a threat to Vettel, who now lead his home Grand Prix, until a convenient but unfortunate and uncharacteristic pit-mistake saw him drop from the race; released from his pitbox without his rear right tyre attached, the Pirelli flew clear of the RB9 and struck an FOM Cameraman, who, excluding some bruising, was otherwise okay. Vettel won the race. Vettel took second on the grid for the Hungarian Grand Prix while Webber started far down in tenth. Vettel dropped to third in the race while Webber progressed to fourth. Coming back from the summer break, the Red Bulls lined up second and third on the grid; Vettel ahead of Webber. Vettel took the lead from Hamilton on the first lap when Hamilton made a mistake coming from Eau Rouge. He was untouchable while Webber, who dropped to sixth off the line, battled to fifth by the time the chequered flag flew. Vettel won the race. Vettel took pole at the Italian Grand Prix, much to the dismay of the local tifosi. Webber joined him on the front row, but was pushed down the order by a fast-starting Felipe Massa. He was overtaken by Fernando Alonso in a stunning pass around the outside of turn 5, but Webber eventually finished third when Massa fell down the order. Vettel cruised to victory. He also took pole at the Singapore Grand Prix which proved to be a monotonous affair as he strolled to victory. Meanwhile, in the other car, Webber was losing his KERS and was then had his engine burst into flames, thus ending his race on the last lap. Post-race, Alonso stopped on-track to pick his friend up and carry him back to the race, prompting the stewards to give both men a reprimand. As it was Webber’s third reprimand, he was handed a ten-place penalty for the next race in Korea. Penalty included, Webber started down in thirteenth. Vettel, yes, again, took pole and, yes, once again strolled to victory. Webber wasn’t as lucky as was t-boned by Force India’s Adrian Sutil in the middle stage of the race, causing his car to, again, burst into flames and cause his immediate retirement. Webber, as if to make up for his recent bad luck, took an unexpected pole position at the Japanese Grand Prix. Vettel lined up second but eventually dropped behind his team-mate when his team decided to put him on an alternative strategy which, luckily for him, handed Vettel the victory, ahead of Webber who finished second. It was back-to-normal though as Vettel took pole and subsequent victory at the Indian Grand Prix. Webber, fittingly, retired with an alternator as his team-mate’s typically flawless car won him secured the World Championship for both driver and constructor. Webber took pole in Abu Dhabi but was beaten off the line by Vettel who was again undefeatable and disappeared into the distance, leaving Webber to battle for second. Webber finished second while Vettel, predictably by now, won another race. In Austin, Vettel won again but Romain Grosjean separated him from Webber who finished third. The threat of rain gave hope that the almost eternally impregnable dominance by Vettel would be somewhat hampered in the unpredictable conditions, but as the race remained largely dry, he was free to cruise to victory for the thirteenth time of the 2013 season, while Webber, suitably, finished second to finish his career in the shadow of his team-mate. Webber made his F1 debut in Australia 2002 and placed fifth in the slowest car on the grid. It was clear he meant business. While his talent was evident, he rarely had the kit to do the job itself. His first season with Jaguar was mediocre while his second season was pretty poor as the team fought its last season. Ironically, the team was sold to Red Bull for just one dollar at the end of 2004. His time in Williams pretty much mirrored his Jaguar experience; his first season was relatively good (his tally of 36 points would remain his highest points scoring in a season until 2009 when he almost doubled that), while his second season with Williams was marred with a string of mechanical failures robbing him of strong finishes, such as a podium position in Monaco. He moved to Red Bull in 2007 as the team were still in their infancy. His first season was just as poor as his final Williams season, with seven DNFs to his name, including the now infamous incident where team-mate to-be Sebastian Vettel rammed him from the back in Fiji. 2008 was slightly better and he doubled his points from 2007, but it wasn’t until 2009 that the long-awaited win finally came to him. Starting from his first career pole position, he made contact with Brawn’s Rubens Barrichello and was forced to serve a drive-through. Nevertheless, his determination to prove the critics wrong drove him strongly onwards and he secured the first of his nine race wins. His appetite for wins only increased after this and he won another race in 2009, four wins in 2010, one in 2011 and two in 2012. Among the trophies above his mantlepiece are two trophies from Monaco, having driven to a commanding win in the principality in 2010 and 2012. 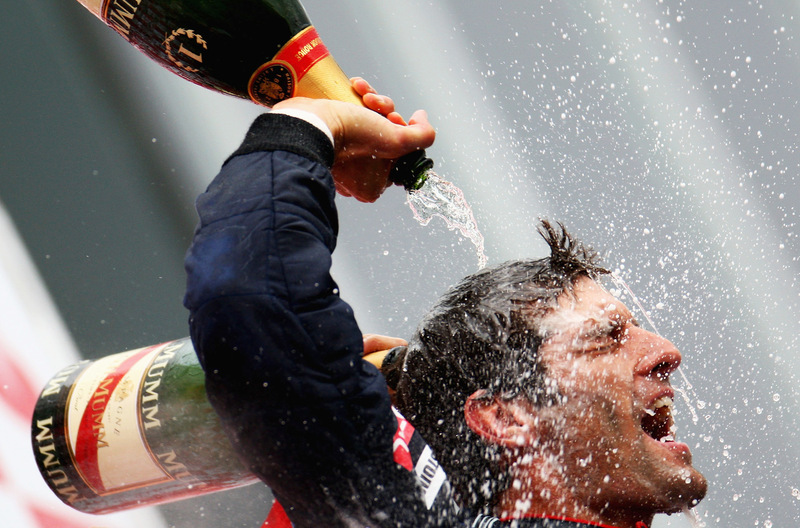 Clearly his 2010 season was his strongest – and it will always be known as ‘the Championship Webber lost’. His wins in Spain, Monaco, Silverstone and Hungary saw him lead the drivers table as the final races of the season arrived. It was Mark’s to lose. I reckon it was his spin in Korea that cost him the win. Running second in the inaugural Korean Grand Prix, he hit wet Astroturf and spun out of the race. His team-mate, who was leading the race, later retired meaning Webber, potentially, could have taken twenty-five points. In the end, he lost the Championship by fourteen. As Vettel came into his stride as the team’s number 1 driver, Webber found himself unable to get to grips with the new Pirelli tyres that were introduced in 2011. His almost went the season winless, except that Vettel developed a suspicious gearbox issue while leading the final Grand Prix and caused him to drop behind Webber. In 2012, he was back with a vengeance and won in Silverstone and Monaco, but 2013 saw him go winless. According to Mark himself, he knew that 2013 would be his last season in the sport before he arrived for the season opener in Melbourne. For this reason, he treated the Aussie media to a dinner before his final home race. What seems to have been forgotten given Vettel’s absolute stronghold over Formula One is that in 2010 he was far from Championship winning material. Clearly he had the speed but he was still living under the shadow of Schumacher, dubbed ‘Little Schumi’ and later ‘the Crash Kid’ following his trip into the side of Jenson Button’s McLaren at the Belgian Grand Prix. Webber was still able to equal Vettel’s achievements and even led the Championship, while Vettel didn’t lead until the final race when he won. 2010 was the first season I watched and it remains my favourite season. Quite contrary to the one-sided Red Bull that has arisen from Vettel’s string of Championships, Red Bull were once evenly split between their drivers. It’ll be a long time, I imagine, until the memory of Vettel moving across Webber in Istanbul of that year will be forgotten by the RBR crew. In fact, it was not the duo’s first incident on track. During the 2008 Japanese Grand Prix in torrential rain, Vettel rammed into the rear of Webber, taking Webber out of the race and setting up a tense foundation for the two the following year when Vettel joined the team. Back to 2010 and more inter-team disputes. Red Bull brought an update to the British Grand Prix in July which included a front wing for both cars. When Vettel’s front wing snapped on Friday morning, the team took the decision to take the wing off Webber’s car and give it to Vettel and to give Webber the old-spec wing, without discussing it beforehand with Webber. He was clearly angry with the decision which he felt demonstrated a clear team favourite. Indeed, when he crossed the line victorious on Sunday, he took a swipe at the team on the post-race radio message, claiming that his performance was “not bad for a number two driver“. Vettel eventually won the title that year from right under Webber’s nose at the final Grand Prix. In stark contrast to the nail-biting conclusion to the season before, 2011 proved to be a mundanely easy Championship for Vettel who won the title with four races left, such was his dominance. On the other hand, Webber struggled to get to grips with the new Pirelli tyres and nearly went winless, except for a convenient gearbox issue on the sister RB7 which saw race-leader Vettel losing his lead of the final GP to Webber. 2012 was a stronger year for Mark but he wasn’t a realistic contender in the Championship which led to another exciting last-race showdown between Fernando Alonso and Vettel, both vying for their third Championship, although Webber did become a double winner in both Monaco and Silverstone of this year. 2013, however, will be remembered as the season where the friction of the previous five years came to a head. In the Malaysian round, Webber was leading following the final pit stop stint. Red Bull, with Turkey ’10 still ringing clear in their memory, ordered Vettel to stay behind Webber through the now infamous ‘Multi-21’ order (which says that car 2 stays ahead of Car 1). Webber, sure that Vettel would comply, went into fuel saving while Vettel continued to charge. Eventually Vettel caught Webber and to the background of Horner’s desperate cries for calm, he battled wheel-to-wheel with Webber for several laps until he finally got past and won the race. This was the end of the public friendship between the two drivers with rumours circling that Webber was to leave F1 immediately while Vettel made a team-imposed apology for his actions. Vettel went on to win the Championship with extraordinary ease while Webber wrapped up 3rd in the Championship. Fittingly, I think, he finished behind Vettel in his final race. Among the myriad of reasons for admiring Mark Webber as a driver was his pure determination. His early days with Minardi, Jaguar and Williams were occasional bright lights illuminating an otherwise poor showing, blighted by mechanical failures and his trademark bad luck. Yet Mark never gave up. His wait to win that all important first victory was the longest in the sport and came in his eighth season in Formula One. His podium topping performance came 24 hours after also claiming his first pole position. Although his new team-mate had claimed RBR’s first race win in China earlier that year (and at a much younger age too), Webber set into motion a battle with Sebastian Vettel which would spill over into the preceding years and last until the end of his career. One of the biggest reasons that I admired Mark Webber was his refusal to give up. Through his (relatively) early seasons with Minardi, Jaguar, Williams and Red Bull, his career was far from fruitful, and was instead riddled with reliability problems or an underperforming car. Yet he waited for that first win, and finally took it. He also never gave up when he broke his leg. While competing in the Tasmania Challenge in the winter break between the 2008 and 2009 seasons, he was hit by a Jeep while cycling. He broke his leg but remained committed to returning to the seat which Red Bull owner Dietrich Mateschitz promised him would be there for him when he was ready to take it. Through extensive and rapid physical therapy, Webber was back in the car when the season started in 2009. In 2010, Webber drove injured as he fought for the Championship. He suffered a fractured shoulder in a mountain bike accident before the Japanese Grand Prix but raced regardless, although failing to tell his team until after the season. The G-forces in the car would have been incredibly painful against Webber’s fractured shoulder, but his determination to race verified his Twitter handle; ‘Aussie Grit’. Mark was also an incredible sportsman. There are very few racers who can race wheel-to-wheel in this age of pay drivers. One of the most memorable moments of Mark’s racing career will be his overtake on Fernando Alonso in 2011. Although Alonso was exiting the pits and was slower than Webber, Mark only pulled alongside the Ferrari as the two men entered the Eau Rouge corner, wheel to wheel on the steep right hand corner which is difficult enough to get right when in single file, nevermind trying it two abreast. This wheel-to-wheel racing demonstrated the commandery and respect between the two veteran drivers, as the same overtake between most other drivers would have ended in complete disaster. I think one of the things that I’ll most miss is the Alonso/Webber friendship and on track respect. I’ll also miss Webber’s outspokenness. Most of the current grid are either fed a team line to pull when it comes to speaking to the media, or censor their words as to impress their sponsors or try to finalize a deal with a team. Webber was never one for holding back. In fact, it was Webber who began the Kimi Raikkonen/Vodka association, claiming that Kimi must have been drunk while driving when he crashed into Webber and caused him to retire from a race. Also, he was quite outspoken about team orders and showing his unhappiness with certain situations, such as venting his frustration regarding the front wing issue of Silverstone 2010. F1 will be running short of straight-talkers in 2014. And so it ends. I’ve often said this season that if he didn’t have bad luck, he’d have no luck at all. I think this is a perfect summation of his career. Every driver hopes to drive for the best team in the world. 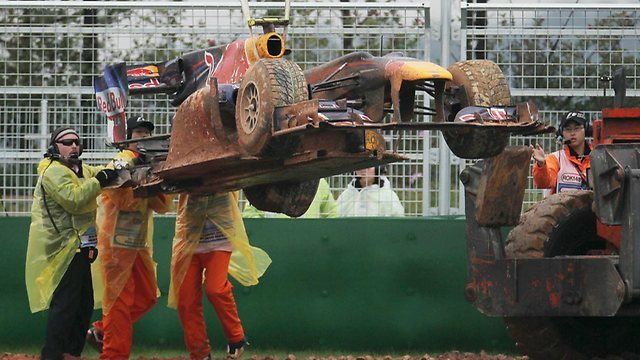 Unfortunately for Mark Webber, he did just that, but alongside the best driver of the generation. From having a slow car to having a good car with an even better team-mate, Webber never had the chance to shine. And although he was never, and will never be a World Champion, I’ll always remember Mark Webber for his ability to fight through the darkness, even when it seemed the world was against him or that the team had it in for him (even if sometimes both probably did). Even though the record books will never do, I’ll always remember Webber as a Champion. Thanks for the memories Mark. G’day mate. Sebastian Vettel has taken his ninth consecutive victory at the Brazilian Grand Prix after a fantastic drive and was him joined on the podium by his outgoing team-mate Mark Webber and Ferrari’s Fernando Alonso. His performance wasn’t flawless as he battled with backmarkers and last-second pit stops, but it was good enough to win the race with a huge margin. Surprisingly, Vettel lost the lead into the first corner, allowing Nico Rosberg to move up into the lead of the race while Hamilton battled Alonso for third. Massa had a strong start and was right behind Mark out of turn three, while Heikki Kovalainen bogged down on the grid and was seventeenth at the end of lap 1, having taken eleventh in Qualifying. Rosberg fought hard to keep Vettel behind him but inevitably lost it on the start/finish straight at the beginning of lap 2, while Alonso passed Hamilton for third. Webber took strong pace out of the third corner to out-drag Hamilton to turn four and pull a stunning overtake on the Mercedes. Webber’s 2014 replacement was trying his hardest to get past the Lotus of Romain Grosjean – but didn’t have to wait long as Grosjean’s engine blew up as he went to cross the line for lap four, becoming the first retirement of the race. Adrian Sutil was unhappy with Sergio Perez who seemed to force him off track at turn five, but stewards deemed the move to have been legal. Bottas began battling Vergne at the same time and was to trade positions with the Frenchman several times before using DRS to good effect and passing the Toro Rosso into turn 1. Slightly further up the gird, old sparring partners Massa and Hamilton were fighting tooth and nail for fifth when Massa was handed a drive-through penalty for crossing the white lines of the pitlane entrance. It was a blow for Massa who stayed out for as long as possible, seemingly to slow Hamilton into traffic and limit the damage of the drive-through. Hamilton was now up to fifth but would not be there for long. Valtteri Bottas tried to pass Hamilton into turn five but the Briton moved across the Finn and made contact with the Williams. Bottas’ wheel went airborne and he retired on the spot, while Hamilton crawled around the track with a puncture and was then handed a drive-through for the incident. The Red Bulls anticipated a Safety Car and boxed both men. However, they were unready when Vettel came into the pits which saw Vettel held up, as well as Webber who was forced to park up behind the pit box as the team scrambled for the correct tires. Vettel’s eleven second lead was halved by the incident, but was saved as Alonso jumped Webber in the pits, forcing the Aussie to retake the Ferrari. Charles Pic was the third man to retire from the race, running off track with a suspected suspension issue. He parked his stricken Caterham on the run-off area in turn six, which is sloped, leaving marshalls trying to push the heavy Caterham to a safer area for several laps. On track, Maldonado was fending off Jean-Eric Vergne and completely closed the gap into turn 1, forcing the Frenchman off the track and spinning his Williams. The much expected rain would have been the only wet spell during a race all season but despite very slight drizzle for most of the race, a full downpour never materialized and drivers could keep using the dry Pirelli compounds. The wet weather could also have thrown a spanner in the works for Vettel, but he remained unchallenged. He crossed the line to win the Brazilian Grand Prix, the second time he has done it, while Webber finished second in his final race, and Alonso took third. Mark Webber was the fastest driver in his final Formula One practice session. The Aussie came out relatively late in a session where tip-toeing around Interlagos was the name of the game as rain once again played havoc with the order. Webber, who usually excels in Brazil, was the only man to break into the 1.27s with Romain Grosjean the next man down, setting a 1.28.1 in the closing seconds. Heikki Kovalainen was right behind his Lotus team-mate, ahead of Valtteri Bottas who always impresses in weather. With wet rain forecasted for the race, he could be in with taking a second consecutive points finish this weekend. Jean-Eric Vergne was sixth ahead of Esteban Gutierrez who is still looking for a seat next year. Pastor Maldonado was eighth for Williams, while the Force India duo of Paul di Resta and Adrian Sutil filled out the top ten in their respective VJM-06s. Lewis Hamilton slipped and slid his way to eleventh overall with Daniel Ricciardo just behind him in twelfth. Next down the order was the back-maker drivers; Jules Bianchi, Charles Pic, Max Chilton and Giedo van der Garde occupying thirteenth, fourteenth and fifteenth and sixteenth, ahead of Red Bull’s Sebastian Vettel in seventeenth. Sergio Perez was eighteenth, and the slowest driver of those who recorded a lap time. Nico Rosberg, Fernando Alonso, Jenson Button and Felipe Massa felt that running in practice would be worthless and chose to sit out the session after setting installation laps. There were no surprises in Texas as pole-man Sebastian Vettel cruised unchallenged to his eighth consecutive victory of the season. Defying fears that Red Bull held over the state of Vettel’s gearbox pre-race, Vettel crossed the line after fifty-six laps with a twelve second lead in his pocket. Lotus’ Romain Grosjean crossed the line in second place while Webber finished third in his penultimate Grand Prix. Vettel and Webber had their usual slow starts off the line but while Webber lost second to a faster-starting Grosjean, Vettel was able to defend from the Frenchman into turn 1 before beginning his predictable drive into the distance. The usual knocks and bumps occurred through the first sector as the grid formed into a single file line, but Adrian Sutil’s contact with Pastor Maldonado was more than just a tap. The German was racing the Venezuelan on the long back-straight and moved left across the Williams inexplicably. His Force India spun right and then left before hitting the barriers with quite a thump and completely shattering Sutil’s front suspension. Sutil was out, as was the Safety Car. Bernd Maylander came into the pits after four laps in the Safety Car leaving Vettel bunching up the grid. By the time he rocketed away in the distance, the cars behind him were too busy falling over themselves to notice that he’d gone. Webber used DRS to pull a stunning overtake on Lewis Hamilton who was evidently uncomfortable in his Mercedes. Chilton, on the other side of the grid, pitted to take his drive-through penalty which was handed down to him for impeding during Qualifying. Lotus stand-in Heikki Kovalainen was also in the pits, recovering from a bad start and changing his front wing. The Finn would later lose his KERS and be restricted to the lower positions through no fault of his own. The RS zone certainly provided plenty of action with the likes of Alonso and Hulkenberg batting tooth-and-nail through there on several occasions. Gutierrez and Vergne, Perez and Gutierrez, Kovalainen and Rosberg also fought for positions at the end of the kilometre long straight. Webber was driving a great race and traded fastest laps with Sebastian Vettel for the majority of the race, but when push-came-to-shove and Webber caught Grosjean, he soon fell behind the Frenchman and couldn’t close the gap. Kovalainen went off track and re-joined, as did Paul di Resta when he tried to battle Jean-Eric Vergne around the outside of corner three – and failed. Valtteri Bottas made a breath-taking overtake on Vergne a few laps later at the same spot, leaving mere millimetres between the two cars as the Finn moved up the order. The other Finn on the grid, Kovalainen, was trying to recover his race and came close to the pitlane while passing Maldonado for 15th. Hamilton held fourth from Hulkenberg and Alonso with ten laps remaining and a fantastic battle ensued. Setting purple lap times in the laps before, Alonso pulled a dummy on Hulkenberg and moved up to fifth in turn 1. Massa in the other Ferrari swept past Maldonado at the same point as Alonso set off to hunt down Hamilton’s Mercedes. Pic was handed a drive-through penalty for ignoring blue flags, to add to his five-place penalty for changing gearbox. Back up front, however, Vettel was in a world of his own as he crossed the line to take his twelfth win of the season – his eighth consecutive victory. Grosjean crossed the line second, marginally clear of Webber whose badly grained tyres gave up on him in the closing laps. Hamilton managed to hold Alonso off while Bottas took eighth, and his first points finish, for Williams. While the checkered flag flew, Vergne and Gutirrez were still battling for position, resulting in the Mexican getting slightly airborne and spinning off track. He rejoined, but firmly out of the points. Vettel performed the now traditional post-race doughnuts en route to his podium finish leaving only one question – can Vettel equal Schumacher’s record of 13 wins per season? Sebastian Vettel was untouchable once again in Austin, leading practice for the umpteenth time this season. The German’s fourteen lap run, one of the smallest runnings of the afternoon, pitched him two tenths clear of team-mate Mark Webber who as per usual occupied second place to reaffirm Red Bull’s stronghold. Lewis Hamilton was the best of the rest, setting a last second lap to place mere thousandths behind Webber’s quickest lap. Nico Hulkenberg had a good showing for Sauber in fourth, with Romain Grosjean a further tenth behind for Lotus. The McLaren duo of Jenson Button in sixth and Sergio Perez in eighth sandwiched Mercedes’ Nico Rosberg while Valtteri Bottas and Adrian Sutil filled out the top ten for Williams and Force India respectively. Fernando Alonso was ominously off the pace in his Ferrari, eleventh on the standings and over a full second behind Vettel. Esteban Gutierrez was twelfth ahead of Heikki Kovalainen who seemed to have lost some of the magic he demonstrated on Friday. Pastor Maldonado, whose sponsor, PDVSA, claim is in at Lotus, was fourteenth for Williams, with Daniel Ricciardo fifteenth. Paul di Resta out-paced Felipe Massa who also finished below par in seventeenth. Jean-Eric Vergne took eighteenth ahead of Charles Pic who was the fastest of the back-markers. Giedo van der Garde was half a second slower than his French counter-part, but nearly a full second quicker than the Marussia of Jules Bianchi who had reigned in the ten second deficit he held on Friday. Max Chilton was twenty-second, and last. Sebastian Vettel was back to his usual spot as fastest driver in Austin when the checkered flag flew on Friday’s track action. Vettel had been running a high-fuel setup in the bizarre FP1 session this morning, but was untouchable in the afternoon. Team-mate Mark Webber, as per usual, was the only man within any reasonable distance of the unstoppable German while Nico Rosberg was once again best of the rest, in third. Lewis Hamilton took fourth in the twin Mercedes, followed closely by his McLaren team-mate Heikki Kovalainen who put in an incredibly impressive performance to take fifth. Esteban Gutierrez was also on the ball in sixth for Sauber ahead of team-mate Nico Hulkenberg and Lotus’ Romain Grosjean in eighth. Jenson Button was ninth, with Ferrari’s Fernando Alonso, who topped the timesheet in FP1, rounding out the top ten. Adrian Sutil was eleventh, with the other Ferrari of Felipe Massa closely behind in twelfth. Sergio Perez was thirteenth as he tries to cement a 2014 drive with Daniel Ricciardo and Paul di Resta finishing the session fourteenth and fifteenth respectively. Valtteri Bottas was a long way back from the third place he occupied in the morning session, the Finn finishing 17th with Toro Rosso’s Jean-Eric Vergne behind him, and ahead of Williams’ Pastor Maldonado. Charles Pic was the fastest back-marker in this particular running, with Giedo van der Garde in the other Caterham finishing ahead of the Marussia duo of Max Chilton (who suffered a brakes failure in the final minutes) and Jules Bianchi.